As I finish up my final project reviews for EdTech 543, Social Network Learning, I’m looking back at all that I have learned. This summer course was 8 modules long and I spent many hours indoors rather than outside enjoying my teaching-free summer hours. I even spent part of my vacation in Maui inside finishing up my final project. Overall, I really enjoyed this course. I came into thinking I knew a lot about Social Media, but this course really opened my eyes to how I can utilize my foundation in Social Media to benefit my students. One of the greatest things about this course was how we were given so much flexibility to explore various Social Media. I can now say I am comfortable using Twitter, Facebook, Google+, Edmodo, Scoop.it, Diigo, Moodle, Jing, and Flickr in the classroom. During the first module, we familiarized ourselves with Facebook, Twitter, Diigo, and WordPress. Luckily for me, these are all platforms I am familiar with through my own personal social media interactions, and from taking other EdTech courses. For module 2, we started to develop a PLN (Personal Learning Network) through Twitter and from creating a mini PLN with EdTech 543 classmates. My mini PLN consisted of Jennie and Dan and we gave feedback to each other during the course as well as created a final project together. In module 3, we focused on creating and maintaining a positive digital footprint, followed different hashtags, and started to be part of live professional development via Twitter and other interactive platforms. I found this week to be very applicable for me because I want to stress the importance of a positive digital footprint to my students. This module was also challenging in that I had to participate in multiple online professional developments while communicating in the “back-channels” via Twitter. This was something I had never done before, but I found it as a great alternative to traditional professional development. For module 4, we focused on curation using Scoop.it. In a previous EdTech class I had to do a similar project using Scoop.it and really enjoyed it. I often find many different articles that I want to use later, but am too unorganized to find them again. Using a curating tool like Scoop.it will help solve this issue. In module 5 we finished up our participation in live professional development and also created a diagram that represented our PLE. 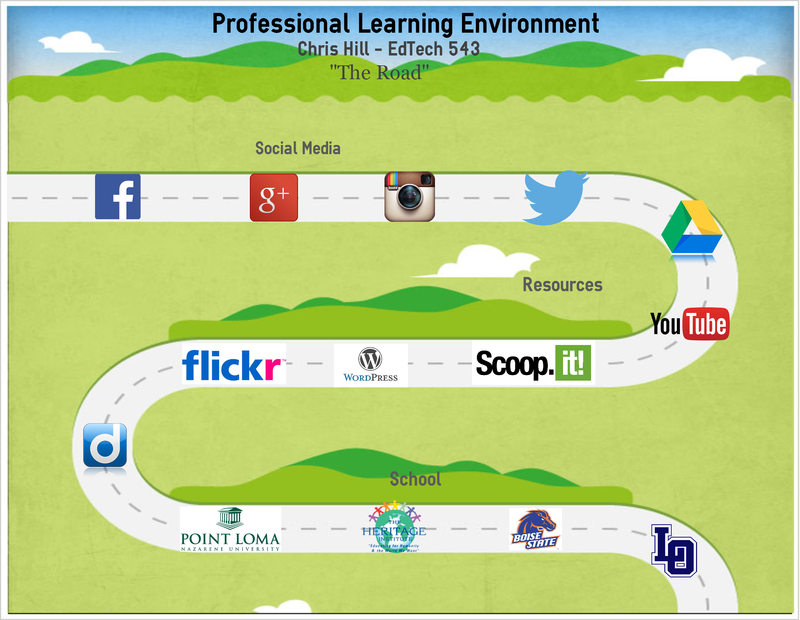 The PLE diagram I created was a road that represented my professional learning experiences. Module 6 is the week that I liked most. During this week we had to create a social media policy for our classroom or school. I chose to create a policy for my teaching situation that I plan on using once school starts back up. Our last module was a group project where we had to create a social networked mini curriculum unit. For my final group project, I chose to use the learning platform of Edmodo. I am not familiar with Edmodo, but decided to just go for it. I found that it was fairly easy to use, but I did not like the overall structure of Edmodo. After using it, I would rather just create a Facebook group and add students that way. I worked with two other high school teachers, whose focus is on Mathematics. We created a unit that had students use social media to find out different ways Math will be used in their future. I really enjoyed taking EdTech 543 and will definitely be integrating social media into my teaching this upcoming year. Currently, my school (and district) does not have a social media policy. We have a technology use plan and policies in place for technology, but they are from an outdated plan developed for 2009-2012 school years. Below are the policies I have created for my classroom. I had a difficult time creating these policies because I wanted them to be stringent enough for a school setting, yet not too much to discourage participation. I believe these policies can be adopted for any classroom at my school and could also possibly be a school-wide policy. 1. Have a plan – What’s the purpose of your social media presence? 2. Online profile is the real you – Your online presence is an extension of the real you. Don’t misrepresent yourself. 3. Deal with conflict positively – It’s ok to disagree with others, but do so respectfully. 4. Be safe – Never post personal info including, but not limited to, last names, birth dates, address, and passwords. 5. Know your privacy settings – Know who can view your profile and post accordingly. 6. Lasting legacy – What you post online does not go away…even if you hit “delete”. 7. Give credit – If the work or words are not your own then cite your source. 8. Pause before you post – Remember that once you post it, it can’t be taken back. Think from another perspective if the content could be offensive. 9. Extension of the classroom – Same rules apply online as they do at school. Make sure you follow the district policies. 10. Report inappropriate content – This includes cyberbullying or any other content that makes you feel uncomfortable or not respected. 11. Post accurately – Make sure you fact-check before posting information. 12. Be professional – Your work doesn’t have to be perfect, but it should have proper grammar, punctuation, and spelling. One motto I have always tried to use is “don’t re-invent the wheel”. As a teacher, we are constantly trying to keep our students engaged in our material with the latest and greatest ways to connect with our students. In this week’s module, we focused on doing research to find educational projects that have social media as a key component. As a business teacher, I found many ways that other Marketing teachers have integrated social media into their teaching. One of the most common things I found is that many school are teaming up with local businesses and using the power of social media to market their company. Often times, students would have to come up with a marketing plan that would integrate Twitter, Instagram, Facebook, and YouTube and the business would choose the group that they believed would work best for their company. The students would then follow through on their plan and be a resource for the local businesses. I think this is something I would like to integrate this next year in my advanced marketing classes. Not only does this give the students real-world experience, but it also helps out local small businesses as well. This is also a great opportunity for students to develop relationships with businesses in the community, which can lead to internships and other job opportunities. Another topic that was common was how schools are using a school wide Twitter hashtag to get feedback from students on a variety of different topics. I definitely would like to start doing this with my leadership class to get feedback on spirit weeks, assemblies, and other activities that we plan. A Professional Learning Environment is like a road. It is constantly under construction while being re-paved, re-routed, and added to. As I viewed many of my classmates diagrams, I noticed many similarities and many differences. Because we are all in an EdTech program, we had very similar content such as Social Media and content creation sites. However, the way in which each diagram was constructed was very different. Some people drew theirs out on whiteboards or paper, while others used advanced photoshop skills to create theirs. When comparing mine to theirs, I find mine in the middle of the road. I used an infographic creator called easel.ly that had the theme of a road. I believe everyone has a different road to their current PLE, and this road is constantly being re-paved and re-routed. As I was creating my PLE, I only put in resources that I currently use (re-paved), even though I could have added resources from when I was younger. Through the creation of my PLE Diagram, I learned that many different things make up my learning environment and that those things have changed over time. I have many different resources I currently use, but soon those may become obsolete and I will have to re-pave my road and add to it. For the past three weeks in EdTech 543, we have been exploring the world of Twitter Chats and Live Webinars. Our mission was to “attend” and contribute to four live webinars and four live Twitter chats. In order to participate in a Twitter chat, you must first find a topic that interests you and determine if there is a set time that topic will be discussed. Once the time has come for the Twitter chat to start, you will search for the hashtag (ie – #EdTechSN) and contribute tweets with that same hashtag. A dashboard application I like to use for participation in Twitter chats and helping manage Twitter is TweetDeck. For Live Webinars, you watch and listen to a presentation while simultaneously participating in discussion via the webinars chat feature and/or via a specific hashtag on Twitter. These Webinars can be held through a multitude of online platforms such as Blackboard Collaborate. Once again, I like to use TweetDeck to contribute to these webinars. All the webinars I participated in were for an online global event highlighting teaching and learning through The Future of Education website and used #RSCON5 (Reform Symposium Free Online Conference). This was a new experience for me to both watch a presentation online while participating in discussion via Twitter. I found it to be so much more engaging and allowed me to share my perspective and learning through Twitter. 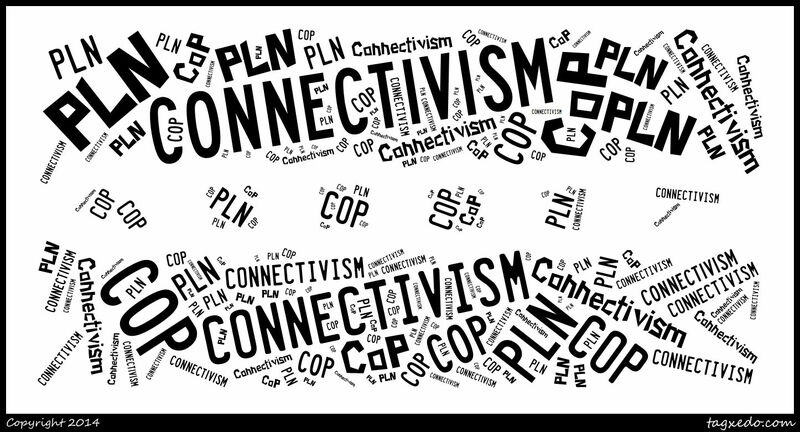 One thing I found quite amazing about contributing to discussion was how my Personal Learning Network expanded because of new followers developed from my tweets referencing #RSCON5. A hashtag can be so powerful. My experience with Twitter chats was mixed. It was amazing to see the participation level difference among the hashtags. Some were easy to follow, and some were overwhelming. One example was the difference between the #educoach and #edmodochat chats. For the #educoach chat that was focused around Instructional Coaching, I asked a question about what attributes people looked for in an instructional coach and never got an answer. This chat was also easy to follow because hardly anyone participated. On the other hand, the #edmodochat I participated in was quite overwhelming. Even using TweetDeck, it was hard to follow conversations because so many people were posting at the same time. When I asked a question in this chat, I had multiple people respond within a minute, which was pretty amazing. After being immersed in the world of Twitter chats and backchannel discussions during Webinars, I look forward to my future of interacting and collaborating with others from around the world. It’s amazing to see how the professional development experience has evolved over time. Thank you Twitter.